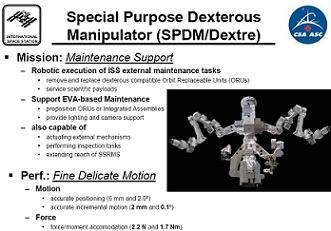 Canada’s Special Purpose Dextrous Manipulator (SPDM), more commonly known as “Dextre” or the “Canada Hand”, has completed a week of highly successful and highly complex robotics operations on the International Space Station (ISS). The never-before-completed operations have raised the bar for fine dextrous robotics on ISS, and ushered in a new era of human-robotic partnership on the station. The SPDM was designed and built by MacDonald Dettwiler and Associates, (MDA), and financed by the Canadian Space Agency (CSA). 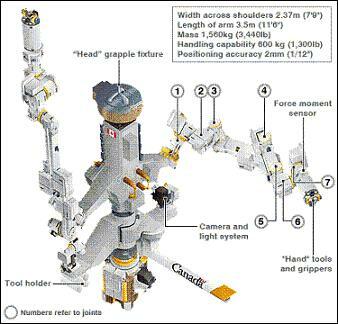 It is designed as a “hand” for the Space Station Remote Manipulator System (SSRMS), AKA “Canadarm2”, and gives the ISS robotic Mobile Servicing System (MSS) the capability to perform fine dextrous tasks. The SPDM was launched to the ISS on STS-123 in March 2008, and is controlled entirely from the ground. The SPDM features two arms, both with shoulder, elbow and wrist joints, although only one arm can be used at any one time. Both arms are terminated with ORU Tool Changeout Mechanisms (OTCMs), which include “jaws” to grasp objects, a retractable socket drive, a camera and light, and an umbilical connector to provide and receive power, data and video to and from a gripped object. In addition to the two arms, the SPDM also features a Tool Holster Assembly (THA) with four tools, which can be grasped by the OTCMs in order to give them additional functions. These tools are two Robotic Micro Conical Tools (RMCTs), which allow the OTCMs to grasp additional types of grasping fixtures. The one Socket Extension Tool (SET) extends the length of the grasping socket on an OTCM, and the one Robotic Off-Set Tool (ROST) allows an OTCM to grasp difficult to reach targets. The SPDM also features the two-sided Enhanced ORU Temporary Platform (EOTP), which is used as a temporary storage platform for up to two Orbital Replacement Units (ORUs) – essentially replacement parts – which the SPDM is working with. 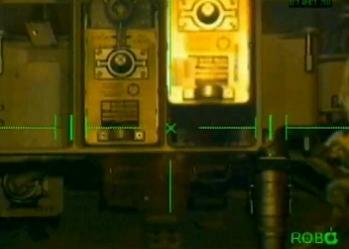 The EOTP was delivered to the ISS on STS-132 in May 2010. Both the arms, the THA and the EOTP are connected to a central body which features a Power & Data Grapple Fixture (PDGF) at one end, which enables the SPDM to be grappled and controlled by the SSRMS, and a Latching End Effector (LEE) at the other end, which enables the SPDM to grapple and attach to other PDGFs on the ISS. Last week’s first task for the SPDM was to Remove & Replace (R&R) a Remote Power Control Module (RPCM) in the ISS’ P1 Truss. An RPCM is essentially a circuit-breaker box that controls the flow of electricity through the ISS’ secondary power distribution system. RPCMs are known to fail on occasion, and the RPCM in question (designated P1-1A-A) has been failed for over a year. Whereas in the past RPCMs have been R&Rd by astronauts on Extra Vehicular Activities (EVAs), the SPDM brings the capability to conduct the intricate operation entirely robotically, saving the need for an EVA and thus enabling the ISS crew to focus on scientific experiments. An RPCM R&R involves the SPDM’s OTCM grasping an RMCT from the THA in order to enable the SPDM to grasp the small fixture on the RPCM. Once the RMCT has grasped the RPCM, the single bolt securing the RPCM to its holder on the ISS is released, and the RPCM is removed. The same process in reverse is used to install a new RPCM into the ISS. The R&R of the P1-1A-A RPCM was originally attempted in July 2010, but a problem was encountered when the RPCM was unable to be extracted from its holder by more than 5 cm, since more force than originally thought was required to pull against small springs on either side of the RPCM. At the time, the robotics operators were not allowed to pull harder to remove the RPCM, since the higher forces had not been analysed, and thus it was not known whether they would damage the RPCM. The August 2010 Pump Module (PM) failure and subsequent EVAs resulted in the RPCM R&R being postponed indefinitely, since the SPDM then needed to gear up for its activities during the H-II Transfer Vehicle-2 (HTV-2) mission in February 2011. Conveniently, the HTV-2 also mission presented an unusual opportunity to perform the RPCM R&R. Following the arrival of Japan’s HTV-2 vehicle and the extraction of the Exposed Pallet (EP) from HTV-2’s Unpressurised Logistics Carrier (ULC) by the SSRMS, the EP was installed onto the Japanese Exposed Facility (JEF) with the Japanese Experiment Module Remote Manipulator System (JEM RMS). The SPDM then removed two ORUS from the EP – the Flex Hose Rotary Coupler (FHRC) and the Cargo Transportation Container-2 (CTC-2). 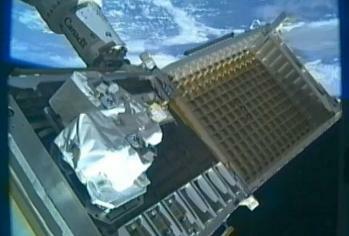 The FHRC, a component of the station’s cooling system, was installed onto the SPDM’s EOTP Side-2. CTC-2, a lidded container used to hold small parts for the exterior of the station (such as RPCMs), was held onto by one of the SPDM’s arms. Both the FHRC and CTC-2 were destined to be installed onto ExPrESS Logistics Carrier-4 (ELC-4), but due to the delay of the STS-133 mission (which was carrying ELC-4 to the ISS) from November 2010 to February 2011, the FHRC and CTC-2 had arrived at the ISS ahead of their home. 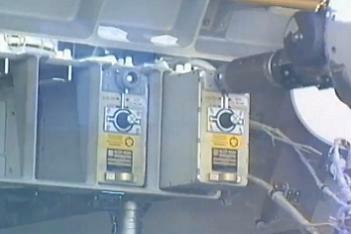 Thus, the FHRC and CTC-2 could only be installed onto ELC-4 after the STS-133 mission had concluded. Since the RPCM R&R task was still outstanding, and since the CTC-2 that the SPDM was holding contained new RPCMs, a unique opportunity presented itself. 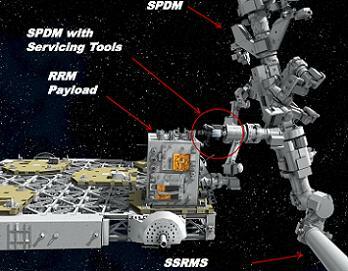 However, since the RPCM R&R could not occur until August at the earliest due to the busy period surrounding the final three Space Shuttle missions and the completion of the station, a problem arose: The Robotic Refuelling Mission (RRM) payload, also destined for ELC-4, was set to be installed onto the SPDM’s EOTP during the STS-135 mission in July. Since the two-sided EOTP is only capable of holding two ORUs/payloads at any one time, having the FHRC and RRM on the EOTP would prevent CTC-2 from being installed onto the EOTP, which is required for the RPCM R&R. 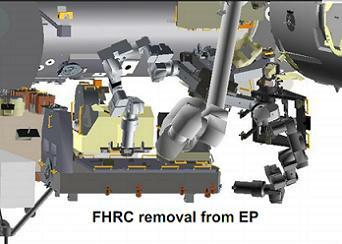 Thus, it was decided that the FHRC would be installed onto ELC-4 by the SPDM following STS-133 as originally planned. Also, since the SPDM would have to make a trip out to ELC-4 following STS-135 anyway, in order to install RRM, it was decided to install CTC-2 onto ELC-4 along with RRM, thus saving the SPDM having to make a dedicated trip to ELC-4 just to install CTC-2. Thus, following STS-133, the FHRC was installed onto ELC-4 by the SPDM, and CTC-2 remained in the grip of the SPDM. Once RRM was installed onto EOTP Side-2 by spacewalking astronaut Mike Fossum during STS-135, the stage was set for the RPCM R&R. Preparation for the RPCM R&R began the week of 1st August, when CTC-2 was installed onto EOTP Side-1. The installation required two attempts over two consecutive days due to an alignment problem. The next task for the SPDM was to practice opening and closing CTC-2’s lid in order to gain access to the RPCMs inside, this successfully occurred the week of 8th August. The actual RPCM R&R operations began on 28th August. They were originally scheduled to begin on 15th August, but were delayed by two weeks due to an MSS software update that was needed to support the operations, an update that was originally supposed to be a part of the delayed X2_R10 transition. On Sunday 28th August, CTC-2’s lid was opened by the SPDM, and the two RMCTs were extracted from the THA by Arm-1 and Arm-2. Arm-2 then grasped the new RPCM inside CTC-2 using the RMCT (with one motor stall in the process). The second day of operations, Monday 29th August, saw Arm-2 remove the new RPCM from its holder in CTC-2, and Arm-1 remove the old P1-1A-A RPCM (which had been unpowered beforehand) from its holder in the P1 Truss. The actual removal involved driving a bolt to release the RPCM, then pulling the RPCM out of its holder, this time with new procedures that allowed the SPDM to “wiggle” the RPCM free of the previously troublesome springs. Once both the new and old RPCMs were extracted from their respective locations, the SPDM performed a 180 degree body roll so that the new RPCM was lined up the P1-1A-A worksite, and the old RPCM was lined up with CTC-2. SPDM Arm-2 then installed the new RPCM into the P1 Truss, in the same holder that the old RPCM had resided in. Arm-1 then installed the old RPCM into CTC-2, in the same holder that the new RPCM had resided in. The new RPCM was then powered up successfully, with everything appearing to be in working order. Arm-1 then stowed its RMCT in the THA, while Arm-2 kept hold of its RMCT. Day three of operations (Tuesday 30th August), which was available as a contingency day in case any operations were deferred from the previous day, saw CTC-2’s lid closed, and the Mobile Transporter (MT), along with Mobile Base System (MBS) to which the SSRMS (with the SPDM on the end) was attached, translate to the Starboard side of the station’s Truss to arrive at the ELC-4 worksite. After taking Wednesday 31st August for a well earner rest, day four of operations (Thursday 1st September) saw SPDM Arm-1 remove CTC-2 from the EOTP Side-1 and install it onto ELC-4, and day five (Friday 2nd September) saw Arm-1 remove RRM from EOTP Side-2 and install it onto ELC-4. The completion of these operations marked the first time since early February that the SPDM had been free of ORUs or payloads, since the FHRC, CTC-2 and RRM were all safely installed into ELC-4. The FHRC, CTC-2 and RRM were all attached to ELC-4 via the Flight Releasable Attachment Mechanism (FRAM), which is an interface which provides mechanical attachment, power and data connectivity between ORUs or payloads, and the ISS. Specifically, the Active FRAM (AFRAM) found on the FHRC, CTC-2 and RRM were aligned with the Passive FRAM (PFRAM) on ELC-4 with the SPDM. 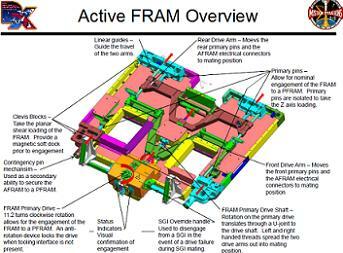 The OTCM, gripping onto the AFRAM via the AFRAM’s standard micro-fixture square, then rotated the FRAM primary drive mechanism inside the micro-fixture square, which attached the AFRAM to the PFRAM on ELC-4 and mated all electrical connectors. The same process is used to attach ORUs or payloads to the SPDM EOTP, which also uses the AFRAM-to-PFRAM interface. 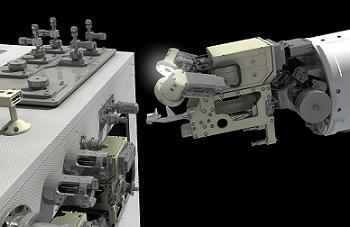 The AFRAM micro-fixture square with FRAM primary drive mechanism is able to be operated by both the SPDM’s OTCM, and a spacewalking astronaut using a Pistol Grip Tool (PGT). The RPCM R&R was a huge achievement for the SPDM, not only because it was an intricate, highly dextrous operation never before attempted in space, but also because it showed that the SPDM team can overcome the challenges presented by such operations, as seen with the successful manipulation of the tricky spring mechanisms that stalled the first RPCM R&R attempt in July 2010. Since all the SPDM’s operations are ground-controlled from NASA’s Johnson Space Center (JSC) in Houston, Texas, and supported from the CSA’s headquarters in Saint-Hubert, Quebec, this means that intricate tasks which previously would have required an EVA can now be done robotically. Due to the increased use of robotics, the frequency of US ISS EVAs is expected to markedly decrease in the post-Shuttle era. However, far from replacing crews, the SPDM will aid crews by allowing them to concentrate on scientific research inside the ISS, which has significantly ramped-up in the post-Shuttle era. The SPDM will see plenty of action in future as it is tasked with removing external payloads from Japan’s HTV and SpaceX’s Dragon vehicles, and installing those payloads onto the ISS via the FRAM interface. The successful RPCM R&R operations also demonstrate an extremely fast-paced learning curve for the SPDM and ground control teams. The SPDM only passed its “final exam” in December 2010, and in less than nine months, the SPDM has completed its first official task of moving equipment during the HTV-2 mission in February, and has now replaced a defective component on the ISS – a first for the SPDM. The SPDM will raise the bar yet higher as it moves into its next role of Research & Development (R&D), as it uses the newly installed RRM payload to develop the techniques to refuel a satellite on-orbit. In the coming weeks, the SPDM will release the launch lock on the RRM payload, and RRM will then conduct a “vision test”. Actual RRM operations are slated to begin in early 2012. Lead Expedition 28 Flight Director Ed Van Cise stated: “This week’s successful replacement of an electrical circuit breaker on the space station’s truss is an important operational milestone. In the past, we’ve only had the option of sending humans outside the station on a spacewalk to perform such repairs. “Having a dexterous robot outside the station capable of doing this while controlled from the ground is a big advance in capability that will free up crew time for important research inside the station. Our Flight Control Teams in Houston and in Canada have outdone themselves, and we’re looking forward to stretching Dextre’s arms on other tasks that will continue to help pave the way for future exploration”.